Twitter is a good invention. It’s easy and fun. Much less demanding and intrusive than Facebook. So much so that many millions of people, from the famous to ordinary people like you and I, use it every day. On the back of that success the Twitter company is doing very well. 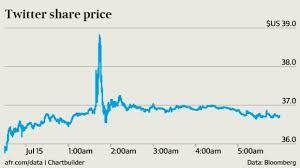 But recently it did even better when its shares jumped four per cent in a matter of minutes. Investors piled in. And not just the amateurs, lots of the ‘professional’ Wall Street guys too. The trouble was, however, that the internet story was on a bogus web site and was completely fake. The site was called “bloomberg.market”. It was not “Bloomberg.com” the official name of the web presence for the Bloomberg financial organization. 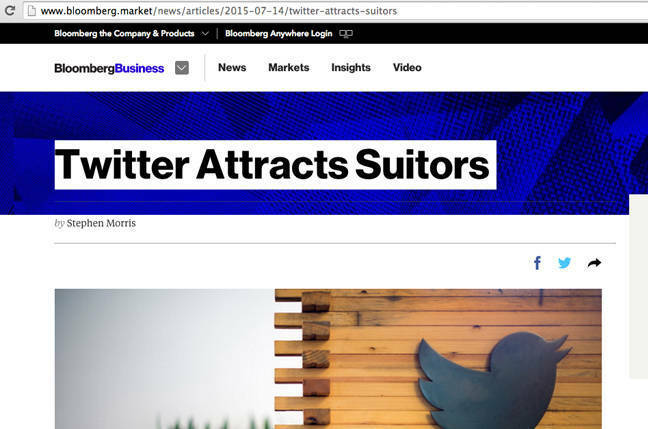 “Bloomberg.market” was what they call a ‘mirror’ of the genuine “Bloomberg.com” website. Whoever designed “bloomberg.market” set it up to look like “Bloomberg.com”. They copied real headlines and linked them back to the real dot-com website. With one exception: the fake Twitter story, which was dressed up to look like a legitimate webpage. The spike in the Twitter share price only lasted about 15 minutes before Bloomberg denounced the story as fake and the share price dropped back to its previous level. But 15 minutes is a long time in the world of finance and plenty of time for someone to profit substantially from the scam. No one yet knows who owns the dot-market domain – except the people who own it, of course – but it was registered just days before the scam message, using a proxy service called “WhoisGuard”, based in Panama, that protects registrant details by offering its own address and contact numbers. But the details of “WhoisGuard” on its own website at “WhoisGuard.com” also appear to be fake, listing a telephone number that is disconnected. Emails to their contact address have not received a response either. The significance of this incident is not that some greedy and stupid people lost money rushing to buy Twitter shares on the back of this fake announcement. The problem is that so many new dot word domains have recently been allowed – hundreds of them in fact – that the whole internet is becoming bloated and confusing. And expensive. If you are a company that wants to protect your online identity and integrity it could now cost you tens of thousands of dollars to cover all the permutations. Not many companies, even huge affairs like Bloomberg, will choose to do that. 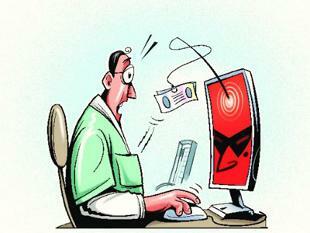 That leaves the way wide open for cyber criminals to take advantage of gullible internet users. I am certain they will. Like the Twitter announcement, it’s just too good a deal to refuse.